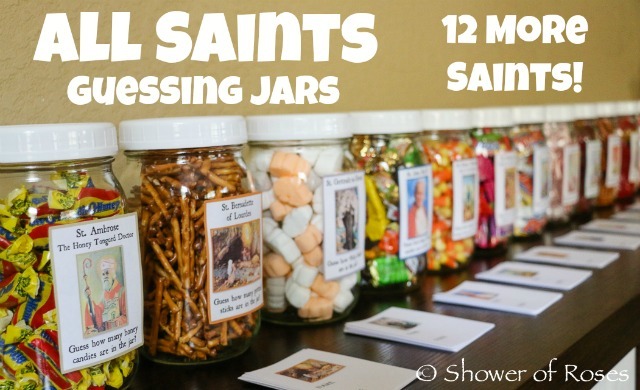 I originally shared this post over at Shower of Roses, but thought I would add it here as well for anyone who is looking for All Saints' party game ideas! 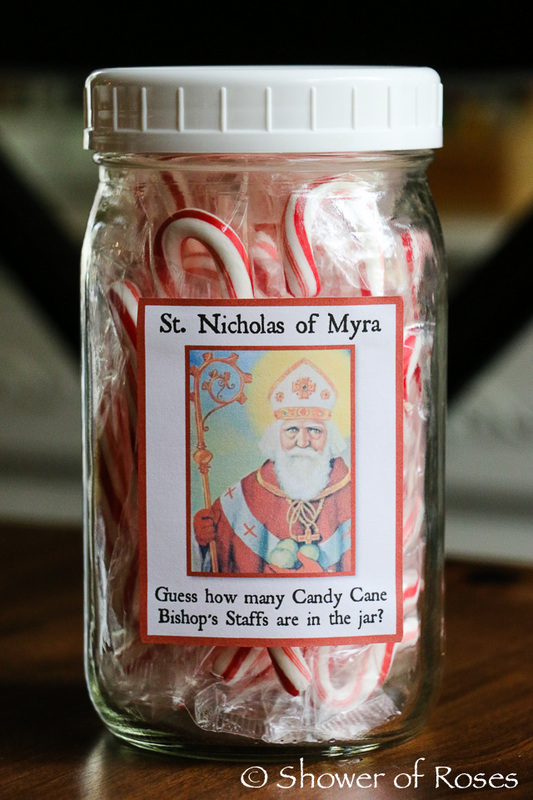 The All Saints Guessing Jars were such a hit at our annual All Saints Party last year that we will be including them again this year with 12 MORE Saint Themed Guessing Jars! 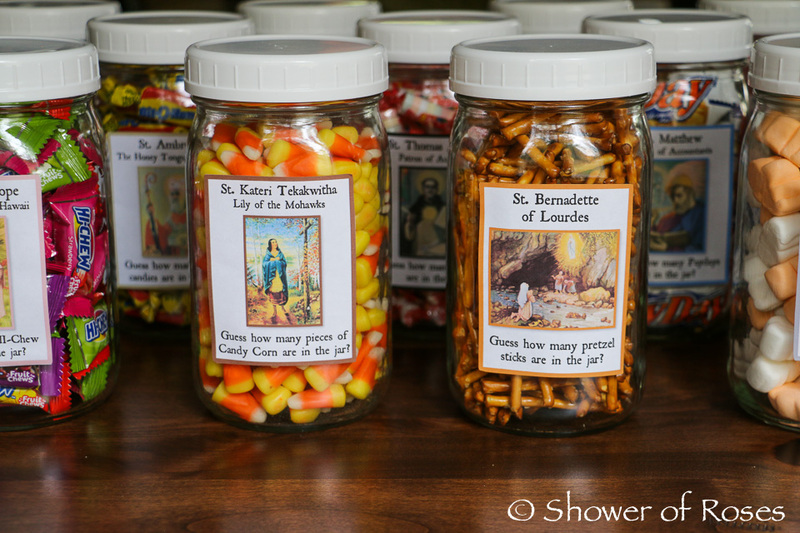 I always have so much fun looking through the aisles at the grocery store and trying to connect some of the goodies to saints and their symbols! 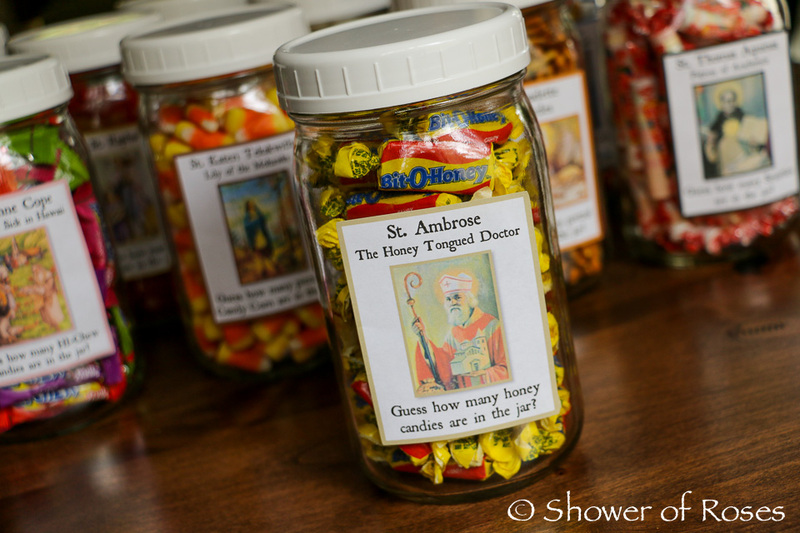 "Bit-O-Honey" candies for St. Ambrose (the "Honey-Tongued Doctor") and Polish Candy for St. John Paul II are a couple of my favorite additions for this year. Once again I used my Wide Mouth Mason Jars with White Storage Lids for each jar. 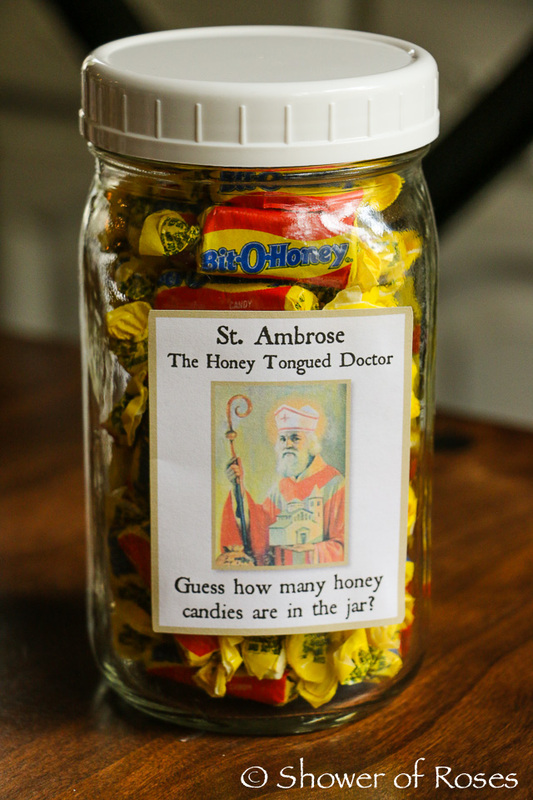 St. Ambrose :: St. Ambrose is also known as the "Honey Tongued Doctor." Any type of honey candy would work for this saint. I picked up three 4.2 oz bags of Bit-O-Honey at a local store to fill the jar. You can also purchase 16 oz. over at Amazon. 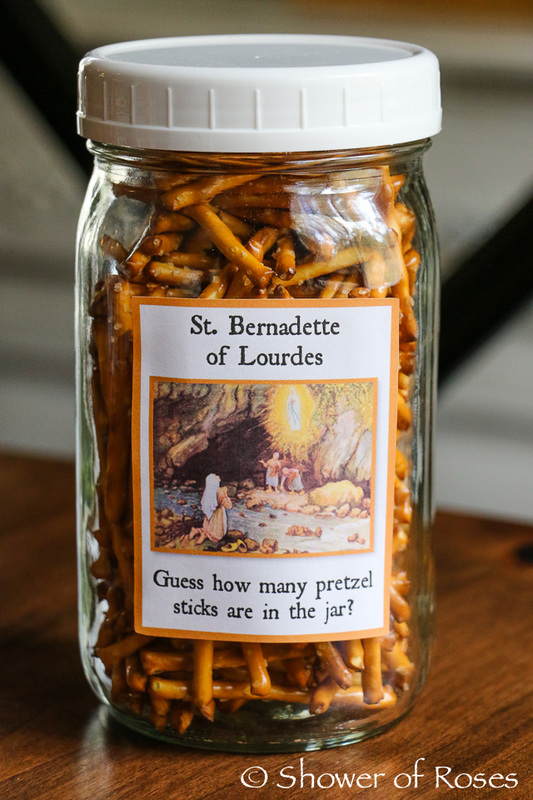 St. Bernadette of Lourdes :: Pretzel Sticks are perfect for St. Bernadette, since she was out collecting firewood when Our Lady of Lourdes appeared to her at the Grotto. 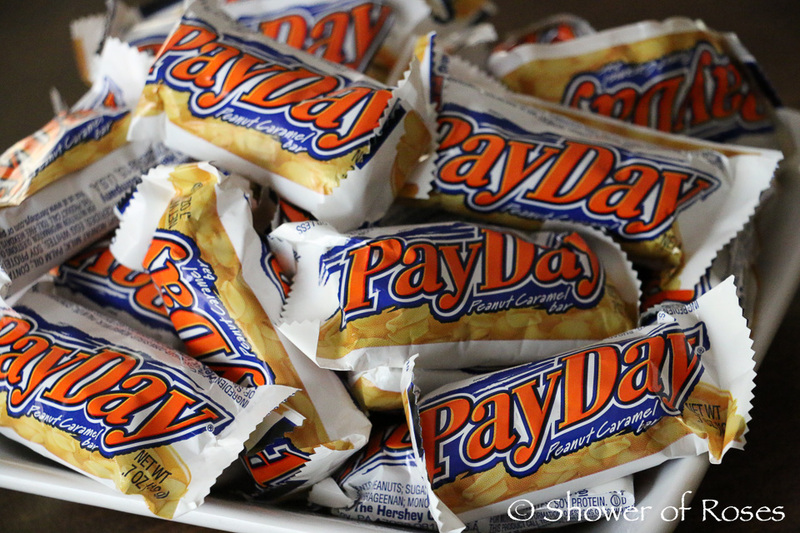 Twix candy bars would also work! St. Gertrude the Great :: Saint Gertrude the Great had a deep empathy for the Church suffering, the Holy Souls in Purgatory. 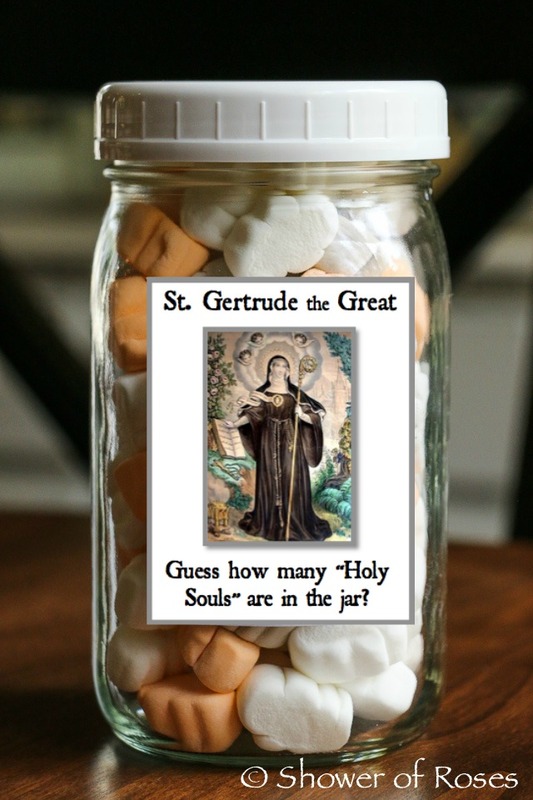 Our Lord shared a special prayer with St. Gertrude the Great and told her that the prayer would release 1,000 Souls from Purgatory each time it is prayed. 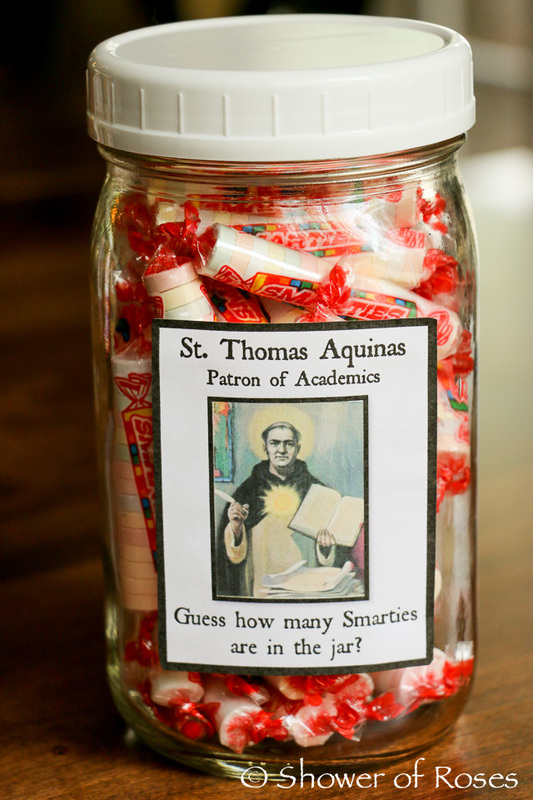 The GhostMallows in the jar represent the "Holy Souls." I used one 8 oz bag to fill the jar and had a few left over. 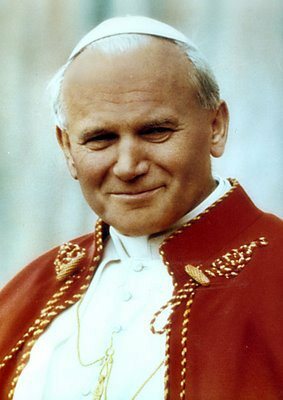 St. John Paul II :: I had to find a way to incorporate the newly canonized St. John Paul II! Polish candy works, right? :) Ours came directly from a Polish friend, but it can also be found on Amazon if you aren't able to find any locally. St. Kateri Tekakwitha :: This saint, who belonged to a Native American Indian Tribe, is also known as the "Lily of the Mohawks." 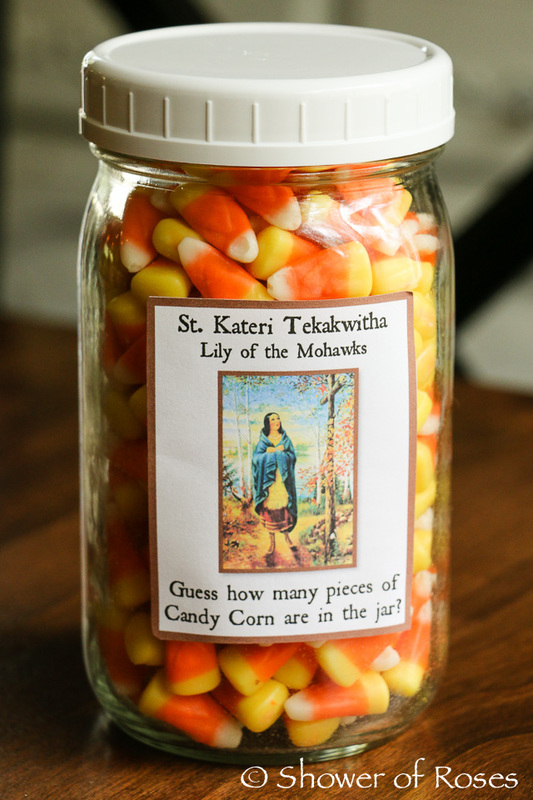 We have made Indian Corn Cookies in honor of St. Kateri in the past, but for the jar I just filled it with one 21 oz bag of Candy Corn. (Though it probably could have used just a little bit more.) 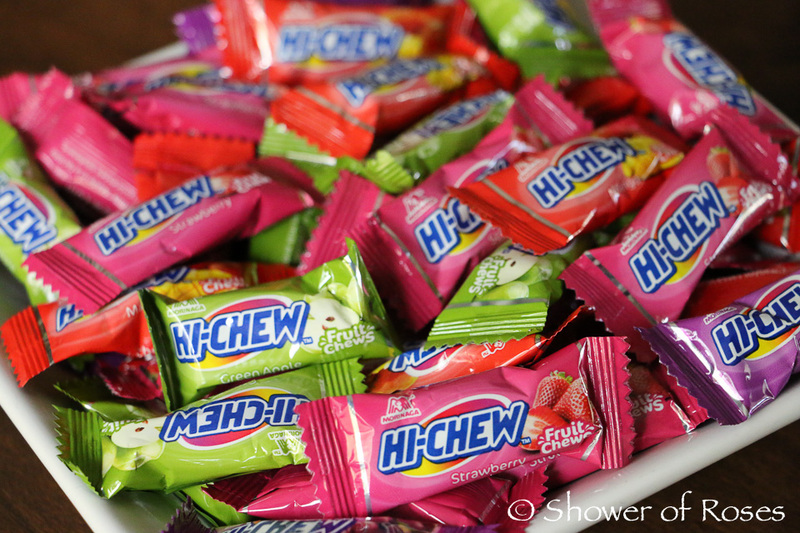 Lily candies would also work. If you have a mold you can make your own! 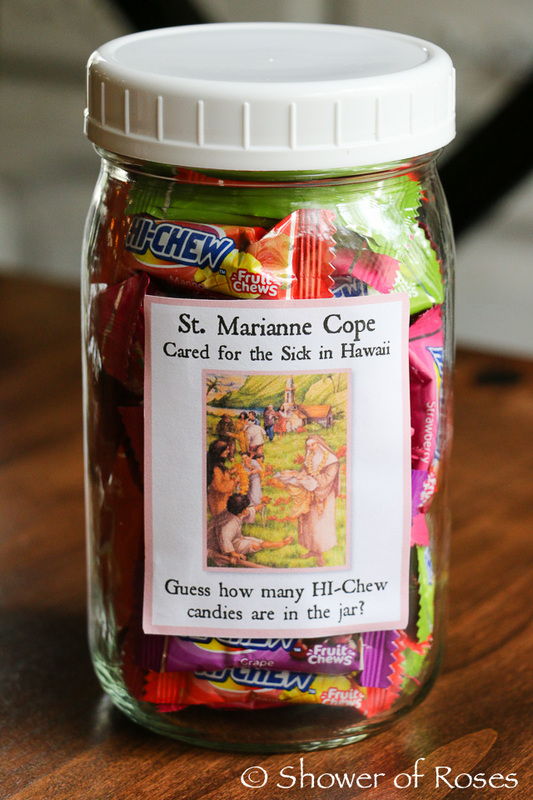 St. Marianne Cope :: HI-Chews are actually a Japanese Candy, but since my family was first introduced to them when my sister brought us some from Hawaii (along with the fact that they have "HI" in the name, the abbreviation for Hawaii) I thought we could get away with using them for St. Marianne Cope, who cared for the sick in Hawaii for 35 years. I bought a big bag at Costco when they were on special for less than $5.00 and only used about 2/3's of the bag. You can also find them on Amazon. 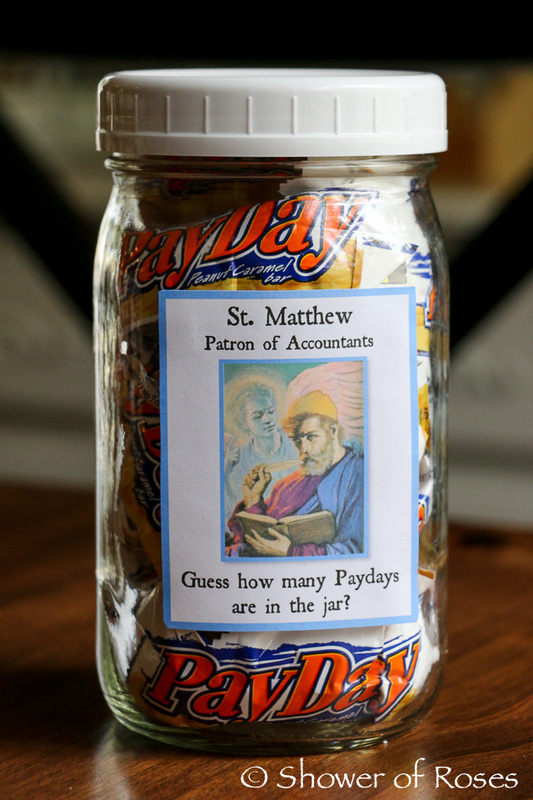 St. Matthew :: My husband thought it might be a little offensive to St. Matthew to fill his jar with "Payday" candy bars, but after I told him that St. Matthew is the patron of accountants he agreed that it was okay. 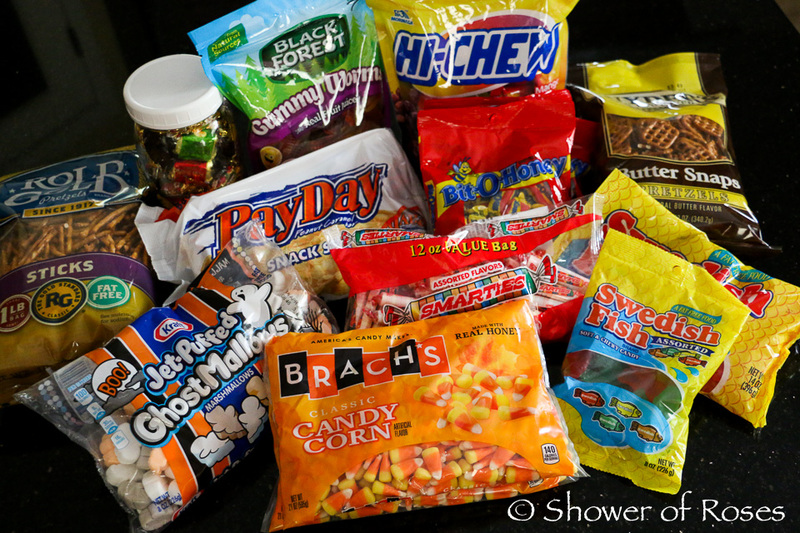 :) I probably should have purchased "fun size" candy bars, but I ended up using about 2/3's of a 20.3 oz bag of the "snack size." St. Patrick of Ireland :: Pious legend credits St. Patrick with banishing snakes from the island of Ireland, chasing them into the sea. 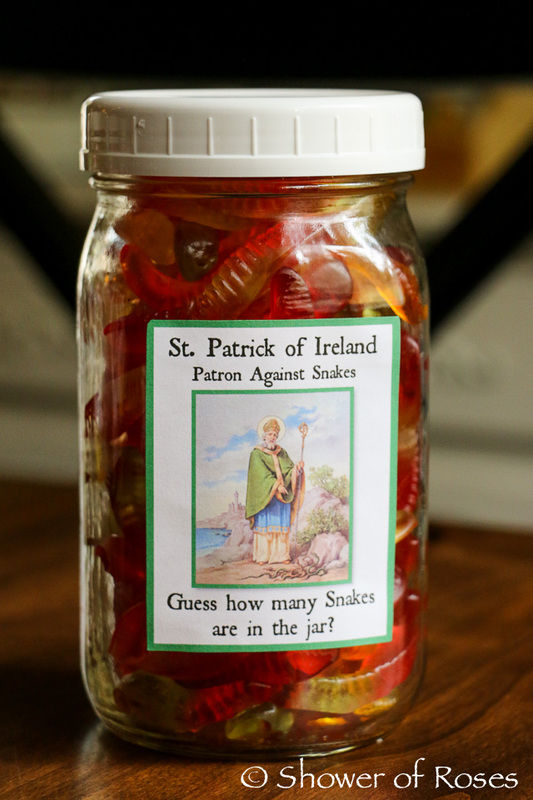 Regardless of whether or not this legend is true, St. Patrick is the patron saint against snakes, fear of snakes, and snake bites. 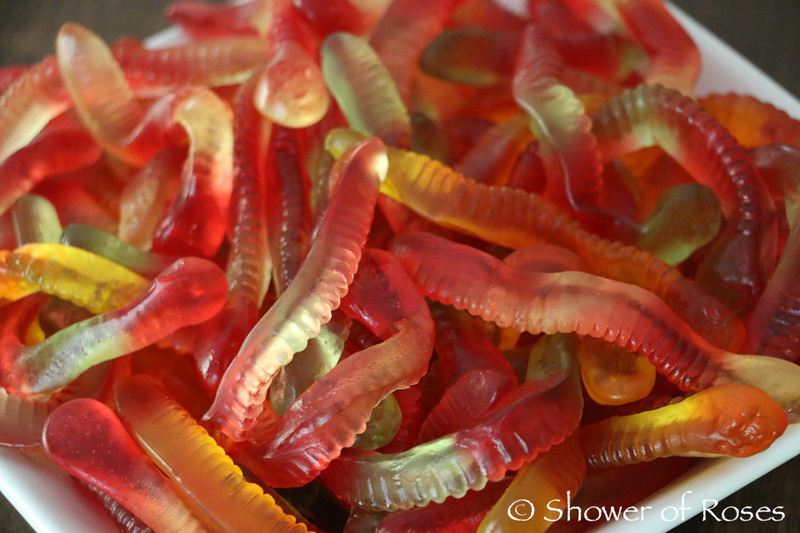 Gummy Worms look like snakes. 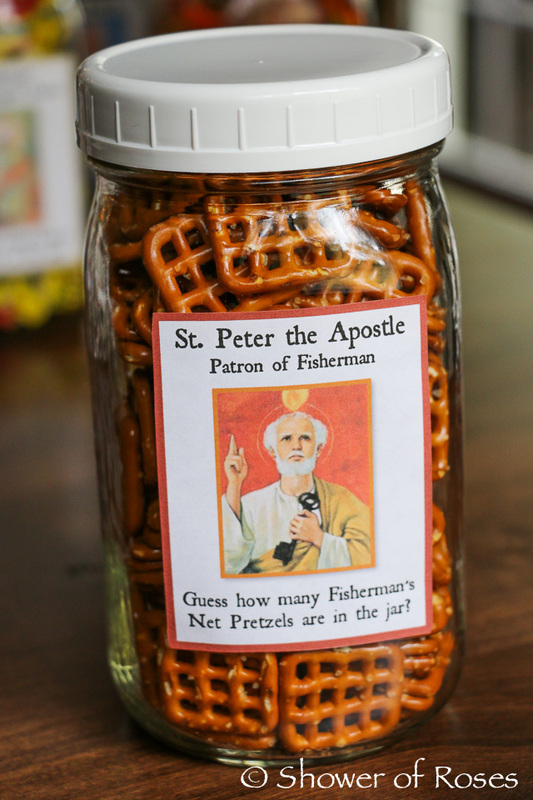 St. Peter :: Butter Snaps Pretzels make yummy little Fisherman's Nets for St. Peter, the patron saint of Fisherman. Fish also would have worked, but I saved those for the next saint on the list. 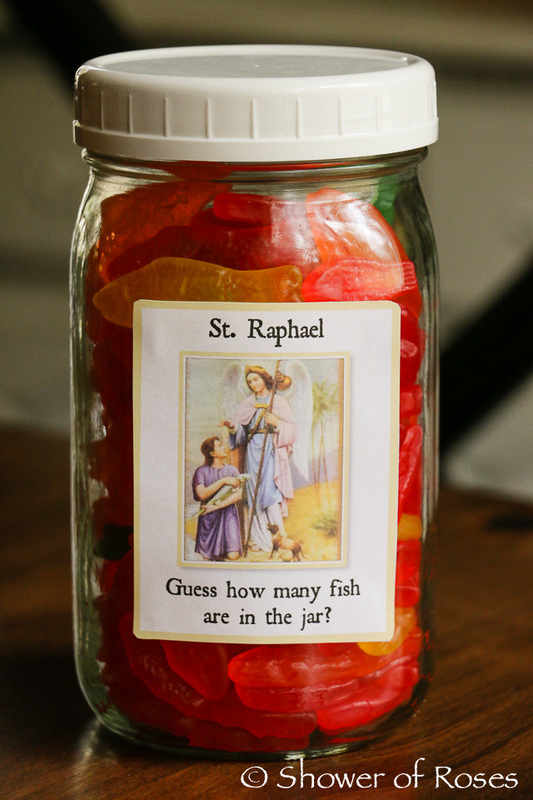 St. Raphael :: There are so many saints that are symbolized in some way with a fish. This year I decided to focus on St. Raphael, the healer, who is recorded as having helped Tobias make balms and ointments from fish to cure Tobit's (Tobias's father) blindness. 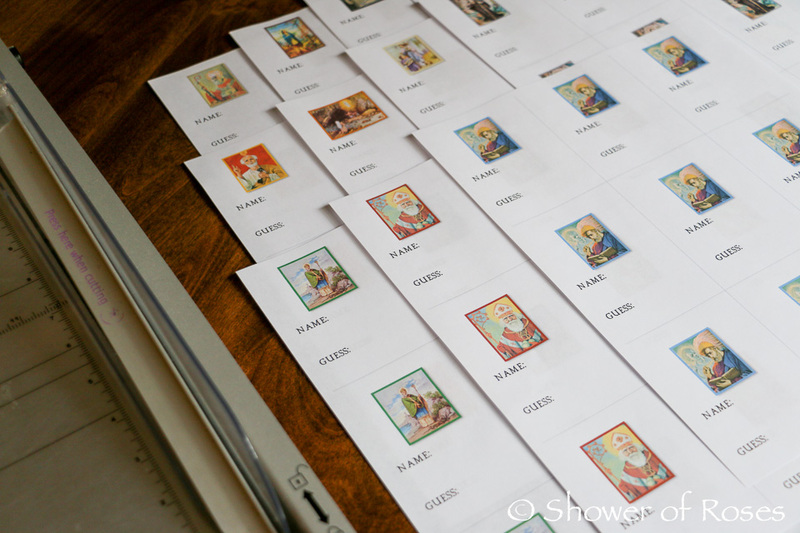 To keep each person's guesses secret I also created little sheets of paper for each contestant to write their name and guess, before folding it in half and dropping it into an empty jar or bag with a matching label. Now to start working on the rest of the party plans! These brother saints from the 3rd century are the patrons of shoemakers and cobblers, which has lead to the lighthearted suggestion of a cobbler style dessert for the memorial feast day. See Charlotte's wonderful St. Crispin's Apple Crisp from several years back. I wanted to share this excerpt from the Feast Day Cookbook by Katherine Burton and Helmut Ripperger, which provides some additional background about the connection to shoemakers or cobblers. The authors also share a basic fruit cobbler recipe following their narrative. This is the feast of two brothers, whose names are oddly alike. Both were bootmakers and cobblers. In France, their native land (though "The Golden Legend" tells us that they were Romans who had migrated to Soissons), many useful objects bear their name. A shoeshine kit is called a "Saint-Crispin"; an awl is "Saint Crispin's lance"; and if your shoes are too tight, you are "in Saint Crispin's prison." For many years there was a special Mass for the cobblers of France on this feast and it was followed by a huge banquet. Legend says the first celebration of this Mass so pleased the saints that they allowed cobblers to have as reward a little preview of heaven. In England, the same custom of a special feast on Saint Crispin's day was observed by the shoemakers. Afterwards they burned torches on the sand, probably as substitutes for the altar lights provided by the shoemakers' guild in pre-Reformation times for their chantry chapel. Just as, some months back, on Saint Anthony's Day we allowed a recipe having as its title a pun, so we give you another for the day of the shoemaking saints. A cobbler may be made with the fruit on top of a biscuit dough or with fruit under the dough. Prepare the fruit and add sugar (the amount will vary with the sweetness of the fruit) mixed with flour or with a well-beaten egg. Make a rich biscuit dough (or use prepared mix) and place in the bottom of a greased baking tin; cover with fruit dotted with bits of butter and bake at 425 degrees F. for about half an hour. Or, cover the fruit with the dough and brush the dough with a little milk or the beaten yolk of an egg diluted with a little water. Apples, peaches, plums, or other fruits may be used. Taking some elements of Burton and Ripperger's basic recipe and combining with internet recipes for a distinctly fall option of pumpkin cobblers, came up with a recipe to honor the cobbler saints of October. Topped with whipped cream, it makes a warm and hearty treat for a cool October evening. Preheat oven to 350 F. Spray a 2-3 quart baking dish with non-stick spray or grease with butter. 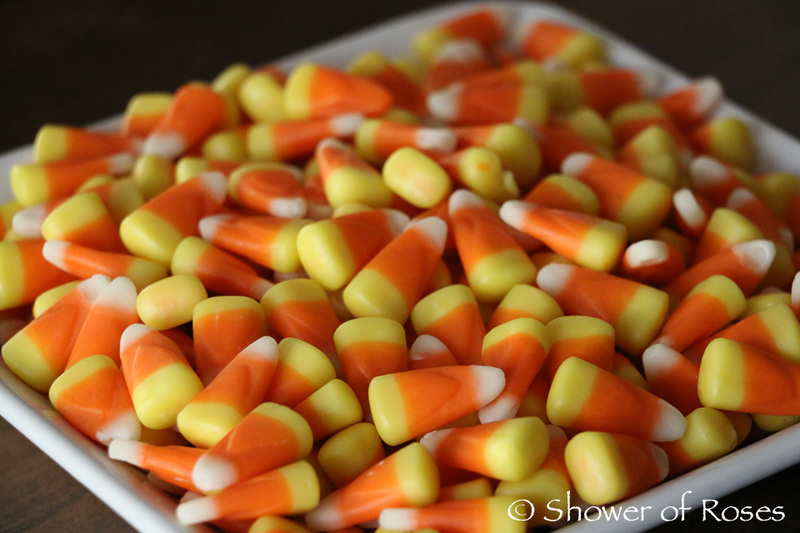 Combine the pumpkin puree, evaporated milk, and eggs in a bowl. Add in both sugars, the flour, pumpkin pie spice, and salt. Pour the mixture into the prepared baking dish. In another bowl combine the flour, granulated sugar, baking powder, baking soda, and salt. Add in the butter. Cut with pastry fork until crumbly. Stir in the buttermilk, adding slowly until the mixture comes together. Don't over stir. Drop the topping mixture by dollops onto the custard. Sprinkle with the brown sugar. Bake until golden brown, about 35-40 minutes. This post was written by Catholic Cuisine contributor, Charlotte from Waltzing Matilda. In a large skillet over medium heat, heat olive oil. Add kielbasa slices and cook for about 10-15 minutes. I like to see a little crust show up in the sides of the sausage. Add garlic and cook for just another 30 seconds until the garlic is fragrant, but not burned. Add cabbage and green onions and stir frequently for the next 10 minutes until cooked. We like our cabbage lightly sautéed but if you like yours more well done, cook it longer, just keep stirring so the garlic doesn't burn. Add pepper (and salt) to taste. I serve this over regular mashed potatoes seasoned with garlic salt. For dessert, I am making Piernik (Polish Honey Bread). It's baking in the oven right now and smells amazing! 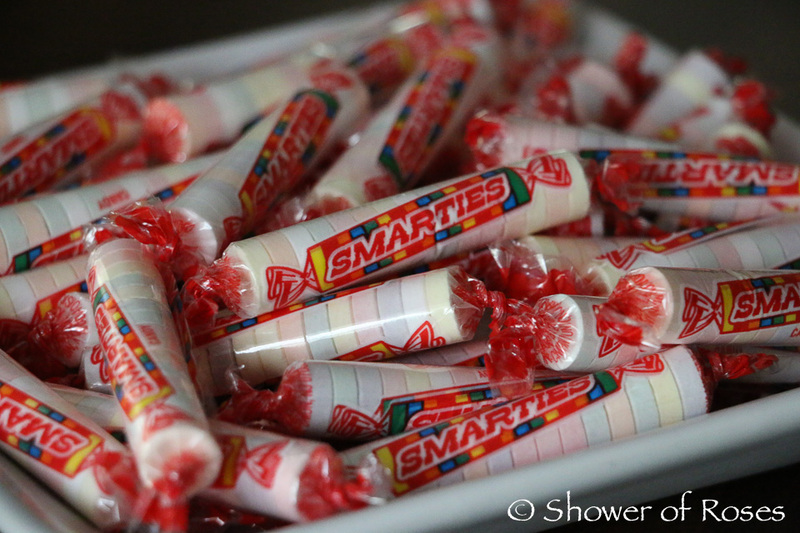 In fact, my 10 year old son just walked into the kitchen saying, "Mmmmmmm…. what is that smell?" Preheat oven to 325 degrees. Grease and flour a bunt pan. In a large bowl, combine the sugar, spices and eggs. Add in the milk, oil, baking powder and baking soda. In a small pot, heat the honey to boiling and then add to mixture. Mix in the flour and stir until blended well. Fold in the raisins and walnuts if you'd like them. Pour into pan and bake for about an hour until a toothpick inserted in the center comes out clean. Allow to cool on a rack and turn out after 20 minutes. Dust top with powdered sugar. I only had a little honey so I made a half batch, that's why my bread is shorter. There is a great article, which was shared over at Catholic Culture today, about St. Luke, Evangelist and Artist written by Jennifer Gregory Miller. She begins by saying that "the month of October is filled with many memorials and optional memorials of saints, but the only two feasts during the month are for St. Luke, Evangelist on October 18, and ten days later Saints Simon and Jude, apostles." 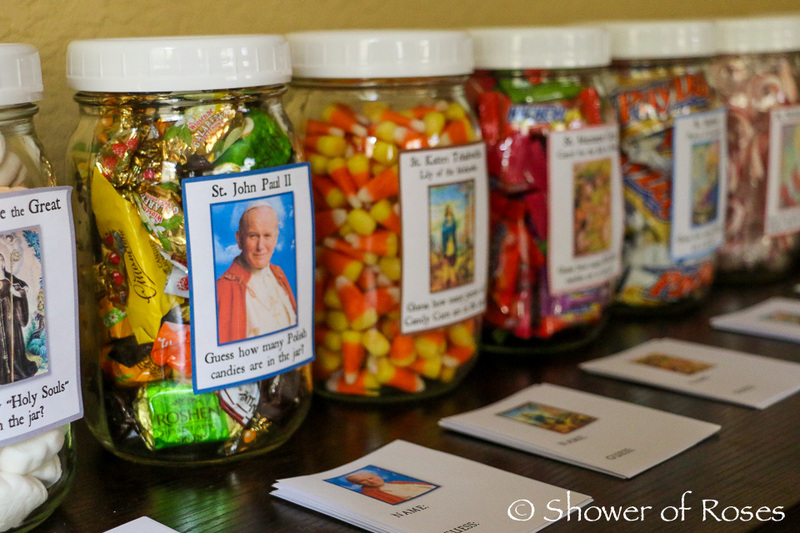 She goes on to say that in her family she likes to "emphasize the various "levels" of feast days, and since feasts are higher than memorials and optional memorials, St. Luke will be honored in a special way." 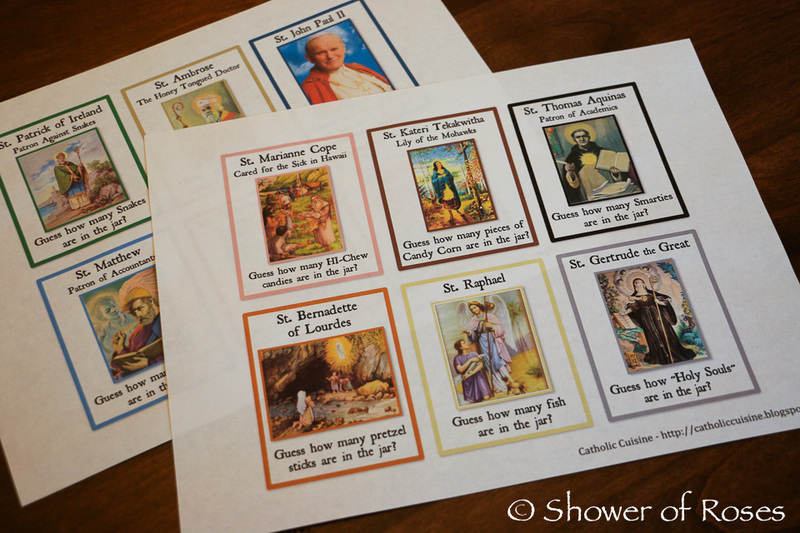 Jenn's article inspired me to plan something extra for the feast of St. Luke this year. I was just telling a friend yesterday that I really need to get started on Tract B of our Art Program for this school year. What better day to kickoff art than on the feast of the patron saint of artists?! So we are going to get started with "A Little Art Study" as suggested by Jenn, after reading about St. Luke in Lives and Legends of the Saints from our October Book Basket. I'm especially looking forward to learning a little more about Our Lady of Czestochowa, the "Black Madonna,"which my girls and I were blessed to see and venerate (the pilgrim icon) at my brother-in-law's parish during our recent road trip. To go along with our art study I looked through my cupboards to see if I could come up with a special treat with the supplies I had on hand. In less than ten minutes I had a little platter of "St. Luke's Artist Palette" cookies all ready for the feast. They are far from perfect, but they were quick, easy, and still turned out cute. My children are going to love them! Twist open cookie. Place an M&M of each color on the white filling. Break a Pretzel Stick in half and attach the Heart Sprinkle to the broken end with a dab of white icing. (Note: If you don't have icing you can use a little of the cookie filling.) 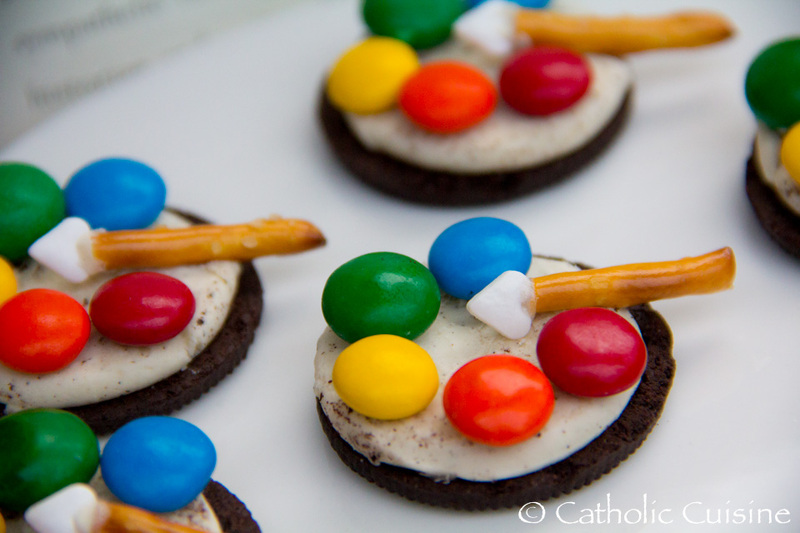 Place the pretzel "paintbrush" on the cookie. All done! St. Luke, Patron of Artists, Pray for Us! St Hedwig, known as St. Jadwiga in Poland, was a 13th century duchess of Silesia and is a historic patroness of Poland. Her feast day is October 16. On this feast day, in that region, there is a bread called Hedwigsohlen (Shoe Soles of St. Hedwig) that was historically distributed to the poor of Trebnitz, the location of the Cistercian abbey which her husband founded and she later entered. The biography at Catholic Culture website states St. Hedwig led a life of piety and solicitude for the sick and poor, including their religious education. She lived a life of poverty and humility, despite her prominent position. Every day, even in winter, she would walk barefooted, so her feet were in bad shape. A story tells us her husband sent her a pair of shoes, insisting that she not be without them — so she kept them under her arm. The shoe soles, depicted in the bread shape, remind us of her generosity to the poor, and the fact that she sacrificed her own comfortable shoes when walking. Mix half of the milk with a teaspoon of sugar and the yeast. Let stand until frothy. Grate the peel of half of the lemon. Mix this and all the other dough ingredients with the yeast mixture to make a smooth dough. It may be necessary to add extra flour or liquid so the dough is pliable. Let dough rest for 45 minutes. Cut the dough into 10 small balls and pieces and form each into the shape of the sole of a shoe. The dough should be about 1/4 inch thick. Put the "soles" onto a greased baking sheet, let rise and rest for about 20 minutes. Bake the bread in preheated oven at 400 ° F (200 ° C) for 20 minutes until golden brown. Five minutes before the end of baking time, brush the top of each "sole" with the mixture of sour cream and egg yolk. 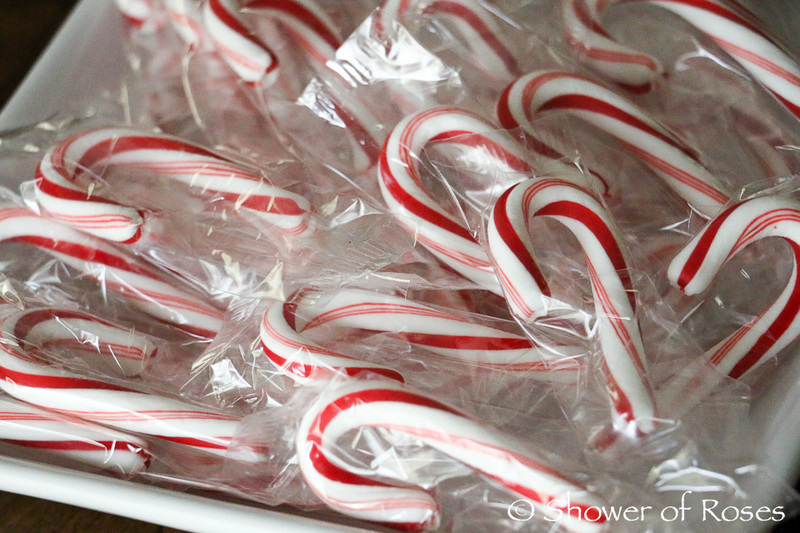 Sprinkle with sugar and return to oven for last 5 minutes. This recipe is from Cooking with the Saints by Ernest Schuegraf. Any bread dough recipe could be used and shaped into the sole shape. In fact, you could use pre-prepared dough or even biscuit or cookie dough as those can easily be cut in the desired shape - and retain the shape well. Lots of possibilities for "sole" food in memory of St. Hedwig. St. Hedwig, Pray for us! October is late harvest time all over the world. The Polish especially have a tradition of emphasizing the and celebrating the harvest season. Late September usually brings frost, so most often only the root crops, like cabbage, turnips, beets and carrots and perhaps some grains are being harvested in October. Old Polish legends talk about harvesting these late root crops and sowing of winter wheat on or just after October 16 which is St. Hedwig’s Day or Sw. Jadwiga in Poland. She is a patroness of Poland and it is said that she sweetens these crops if they are left until that date. To do kapusty Pan Bog miodunada. God grants honey to the cabbage. Another mid-October feast is tied into Polish harvest lore. It is also said that by St. Luke's Day (Sw. Lukasz), October 18 all the work in the field should have been completed. They might chant: "Sw. Lukasz day, co w polu szukasz?" (Translated: "On St. Luke's Day, what are you looking for in the fields?"). 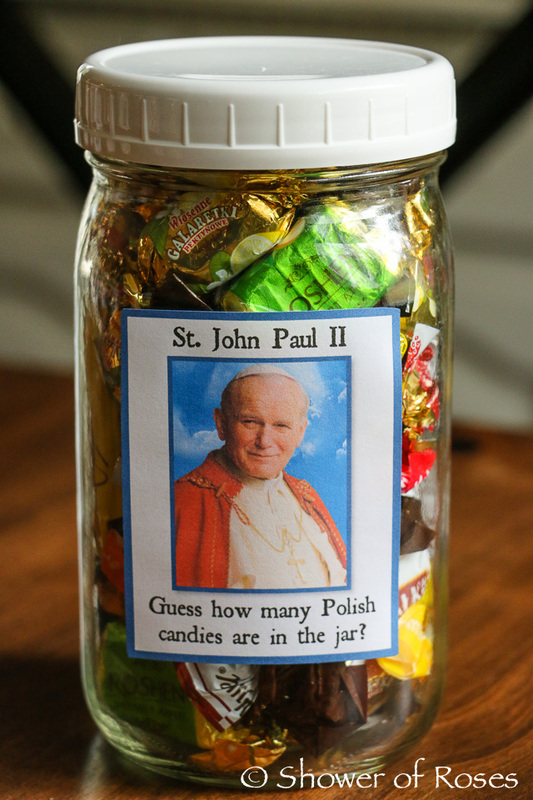 And of course there is St. John Paul II's feast on October 22. So to celebrate the late harvest season and the root vegetables, to recognize a couple October saint feast days, and give a nod to my Polish heritage, I have a couple hearty recipes to share. 1-2 T balsamic vinegar, optional for drizzling. Preheat oven to 375°F. Spray a baking sheet pan with nonstick cooking spray. 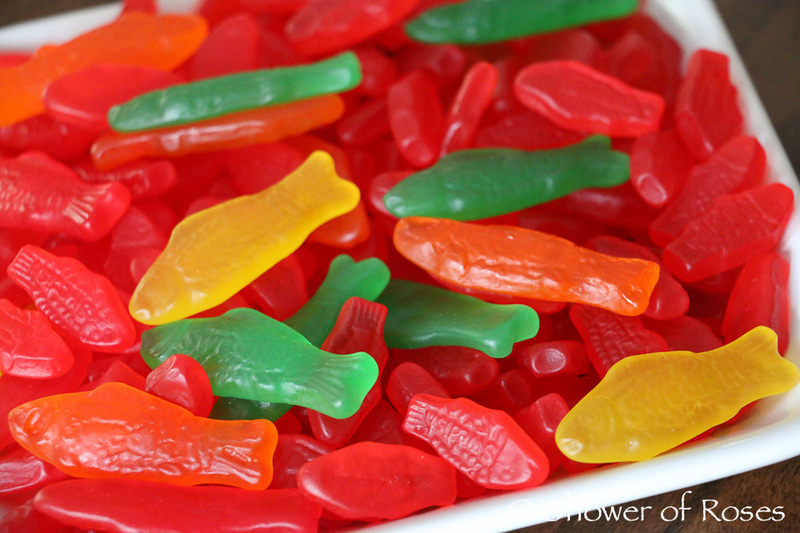 Combine all ingredients in a mixing bowl and toss to combine. Place mixture on a baking sheet and bake approximately 30 minutes. Turn vegetables every 10 minutes until vegetables are tender and slightly browned. Drizzle with balsamic vinegar before serving. Polish people make a lot of zupa (soups), and starting with the cold weather and the harvest, soup is a wonderful addition to any meal. Here is one that combines some of the root vegetables that are common in Polish fare. In a Dutch oven or large kettle, saute the cabbage, onion and garlic in oil until tender. Add water, vinegar and brown sugar to cabbage mixture. Stir in remaining ingredients. Bring to a boil. Reduce heat; cover and simmer for 60-70 minutes or until vegetables are tender. Makes 8-10 servings. 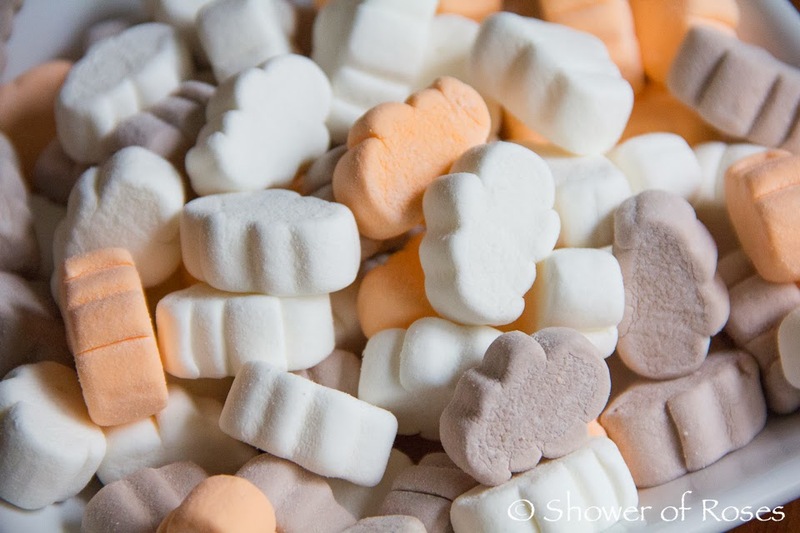 An interesting tradition in Spanish cooking is the abundance of monastery sweets that call for many egg yolks. This is thought to come in part from sherry and wine producers, who used egg whites for refining or clarifying wines. The remaining yolks were often given to a convent or monastery in town for use in baked goods and confections. The most famous of these sweets are candied egg yolks called simply, yemas (meaning “egg yolk”) or Yemas de Santa Teresa because of their association with the convent in Avila. Yemas are a rich and creamy, traditional Spanish dessert made from egg yolks, granulated sugar and water, then coated in powdered sugar. Yemas de Santa Teresa are a popular treat on her feast day, October, 15. Put water, sugar, and lemon peel into a small saucepan. Dissolve the sugar, while bringing the water to a boil. Continue to cook until the mixture is at soft ball stage (238 degrees), stirring often. Remove from heat, and remove peel. Separate the yolks from the whites and beat the egg yolks. Pour the beaten egg yolks into a saucepan. Pour the hot mixture into the egg yolks, stirring constantly. With heat on the low, stir the mixture slowly and continuously with whisk, until the yolks begin to solidify – up to 10 minutes. The mixture will easily pull away from sides and bottom of pan at this point. Remove from heat. Spoon onto a plate and allow to cool. After the mixture has cooled, sprinkle powdered sugar through a sieve onto a countertop. Place yolk mixture on top and roll it to cover in sugar. Pinch off a small bit of yolks, about size of a walnut. Roll it into a ball and roll in powdered sugar to cover. Chill yemas in refrigerator. The powdered sugar on the outside will form a small crust as the balls cool. Makes about 8-10 yemas. 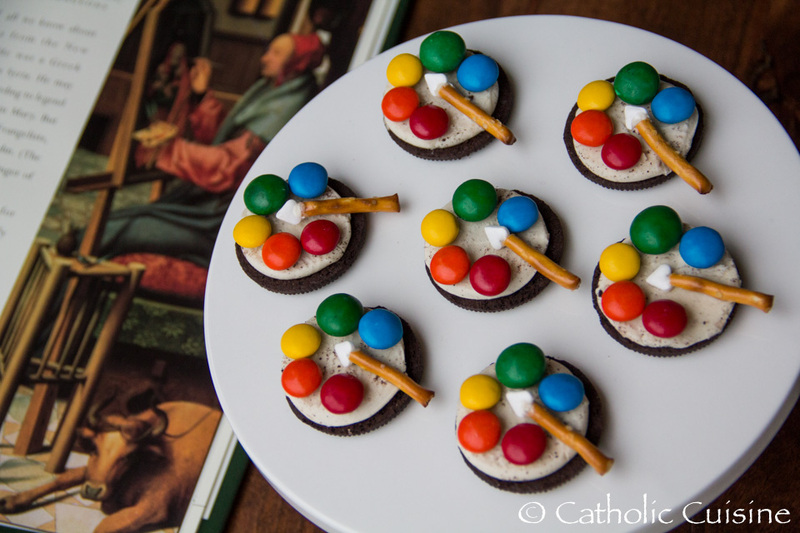 When I saw these cookies last year, suggested on Pinterest by a super creative French friend of mine for the Feast of St. Francis (HT: Mattie Nelson), I knew they would be a perfect addition to Catholic Cuisine ideas. These specialty shaped cookies go by various names. Known as Dents de loup in France or Wolfszähne in Germany, they are Wolf's Teeth Cookies. One of the most famous stories of St. Francis of Assisi is that of his coming to the aid of the town of Gubbio, when it was terrorized by the ferocious wolf. 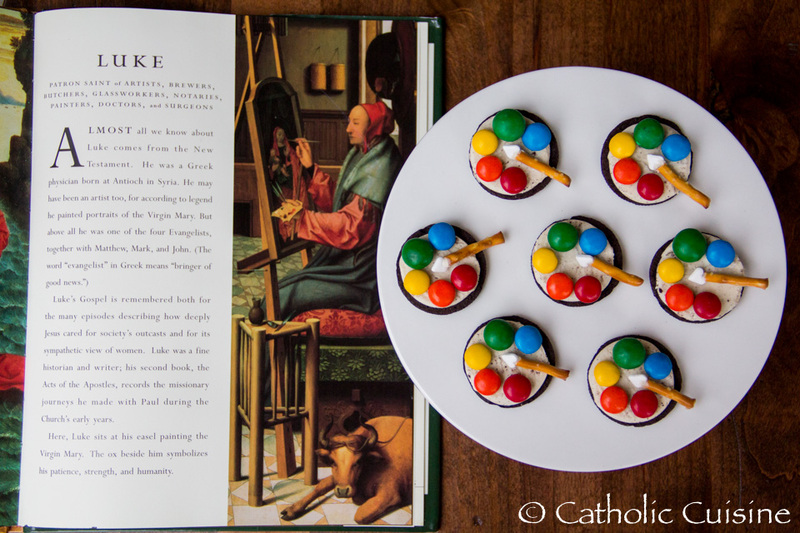 These fun cookies can remind us of the Wolf of Gubbio on the Feast of St. Francis of Assisi. Cream the butter and sugar with hand mixer until light colored, fluffy. Add flavoring, mix. Add eggs one at a time and mix. Mix in flour, a little at a time, about 1/4 cup of the flour each time. Butter/grease the pan* ridges. Drop a walnut sized balls of dough off a spoon into the ridged form. Keep well spaced so they don't run together. I cut the recipe to one third when I made them and it made 20 cookies. Bake for 15 minutes, until golden brown on top. I didn't have a Dents de loup or Wolfszähne pan, and didn't want to buy one as it is not likely something I would use very often. So in the austere spirit of St. Francis, I decided I could improvise with a simple disposable and inexpensive option. Using a large, flat-ish disposable aluminum pan, I made a modified baking pan. I cut off the ridged edges all around, clipped the corners to flatten and spread flat. I rolled a rolling pin over it to take out the indentations and get it as flat and smooth as possible. Then I folded over approximately 1 1/2 inch, flipped and folded again (fan fold style) until I had a makeshift "dents de loup" pan. As I figure most of you don't have a specialty pan like this or the desire to purchase one, I hope this is helpful and manageable alternative.